Good News! Studhubs and I survived Jonas, also known as Snowpacolypse. We got about 16 inches of snow, which is nowhere near the 30 inches that many accumulated, but is a pretty significant amount for our area. The entire town was shut down and we were snowed in for the weekend. There was a lot of fuzzy blankets, Netflix, reading, naps, and FOOD! 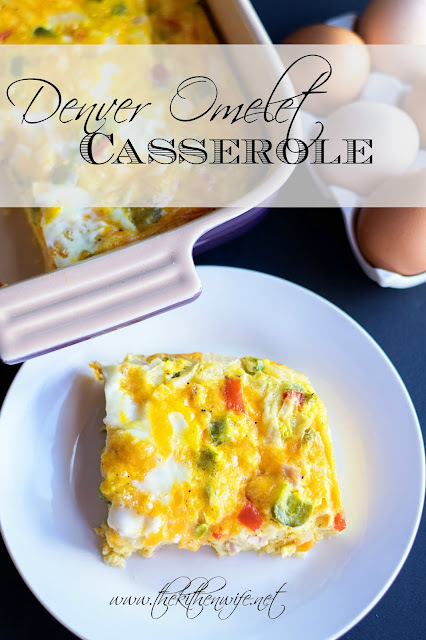 On days like this I LOVE making dishes like my Denver Omelet Casserole! Next, in a greased 9 x 13 casserole dish, place the ham, onion, peppers, and garlic. Now sprinkle the shredded cheese over the top of all of the vegetables and ham in the casserole dish. Crack the entire dozen of eggs into a large mixing bowl and add the milk. Beat the eggs until everything is well incorporated and mixed together. Now pour the egg mixture over everything in the casserole dish. 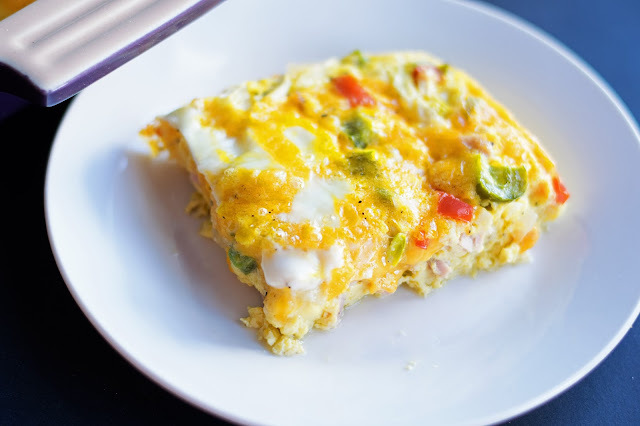 I took a rubber spatula and kind of pushed things around so that the egg mixture permeated all of the filling for the Denver Omelet Casserole. Place the Denver Omelet Casserole into the preheated oven and bake for 1 hour. Look at how colorful this is coming out of the oven it is smells divine! Let the casserole sit for 10 minutes and then cut out a slice. In a greased 9 x 13 baking dish add the ham, onion, peppers, and garlic. Crack the dozen eggs into a large mixing bowl and add the milk. Pour the egg mixture into the baking dish. Place into the preheated oven and cook for 1 hour. Remove from the oven and let set for 10 minutes. Oh this looks so good! It would be perfect for Christmas and big family gatherings. Great recipe!!! Thank you! And yes, I was also thinking this would be great around the holidays!